If you have a song request, please fill out the form below. J.J. Williams, a soldier "In The Army of the LORD" at KWWJ-AM Gospel 1360, is on a mission to live a life that exemplifies Jesus Christ. Born: in Chicago, Illinois to his loving parents Mr. & Mrs. Marion E. Johnson and He is a 1988 graduate of Texas Southern University majoring in General Business. Born Again In 1997-while attending South Post Oak Baptist Church, hearing the Gospel of Jesus Christ preached by Pastor Remus Wright, his faith in God was acknowledged and J.J. accepted the life, death, burial and resurrection of Jesus Christ for the forgiveness of his sins, he then was water Baptised in October of 1998 and began to trust Jesus Christ as Savior and Lord. J.J. has extensive professional experience in radio broadcasting. 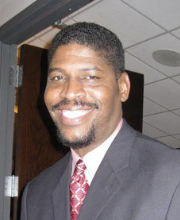 Since 1984, J.J. worked as a mobile disc jockey throughout the Houston area and then in 1989 was hired as Jammin’ J.J. Williams to work on the air at, KMJQ-FM Majic102. After being on the air for 13 years at Majic 102 and D.J.-ING in various nightclubs around town, J.J.'s faith in God was tested! On September 15, 2001, the Lord spoke to J.J. saying; "Tonight is your last Night!" So taking a leap of faith, J.J. left Majic102 in 2001 that night…. Then, after going through divorce, many tests and trials, on May 1, 2002, J.J. met Rev. Darrell Martin the General Manager of Gospel 1360 and after one meeting with Rev. Martin, J.J. Williams was hired on divine assignment to work in radio sales and be the host of the afternoon drive program, J.J. calls, "The Afternoon Delight!" You can hear him daily from 3pm to 6pm Monday thru Friday on The station that keeps walking with Jesus- Gospel 1360! J.J.’s Purpose in life: is clearly to be a Christ loving Husband to his wife Lady Willane! To keep the unity flowing in the Body of Christ through intercessory prayer, gospel and inspirational music on the airwaves, preaching, teaching and evangelizing the word of God and fellowshipping with God's people. J.J. enjoys reading God’s word, watching sporting events, eating healthy food at different kinds restaurants, staying physically fit, shopping with his wife, inspiring, motivating people to grow and develop into their purpose. J.J. is forgiven, restored-renewed and walking in Victory! By God’s Grace, J.J. and his Wife Willane are active charter members, serving in ministry at THE FOUNTAIN OF PRAISE CHURCH, Pastored by Dr. Remus and Pastor Mia Wright! J.J.'s favorite scripture is in Proverbs 3:5 & 6 "Trust in the Lord with all your heart and lean not unto your own understanding, in all your ways acknowledge him and He shall direct your path!" Hallelujah! Tune in to the "Child's Plate"